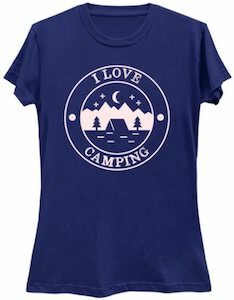 Now there is a I love camping t-shirt that is just made for you. On the camping t-shirt it shows a circle with in the middle a scenery with a tent and the nights sky and around that scene it says “I Love Camping”. 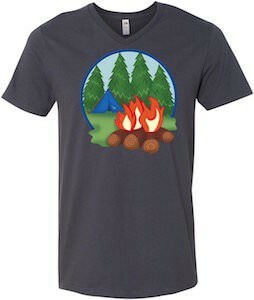 And this camping t-shirt is available in styles for both men and women and it comes in sizes Small – 6XL and in many colors and they are made from 100% cotton. 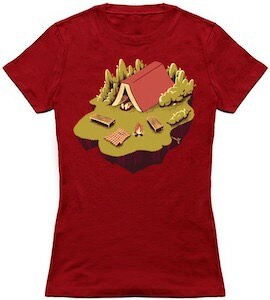 Now you can wear the love of camping on your chest all thanks to this t-shirt that is all about the camping. If you only drive with a trailer once I a while then you want to check out this sorry trying to park the camper t-shirt. The t-shirt is available in a bunch of colors and in styles for men and women and yes it does come in many sizes too. 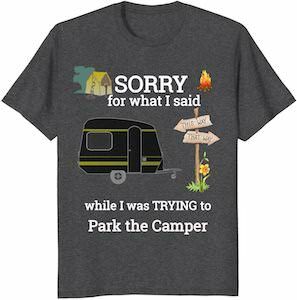 On the t-shirt you can see a campground with an RV, tent, campfire, and some signs and then there is the text that says “sorry for what I said while I was trying to park the camper”. So now you can go camping and wear this t-shirt so that you can stop apologizing for your bad behavior while parking the RV. 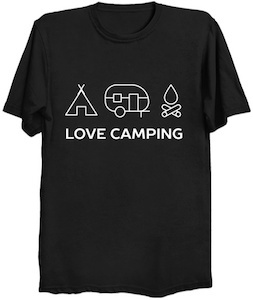 If you like to camp then you should check out this love camping t-shirt. The t-shirt is available in many colors and in styles for men and women and it comes in sizes Small – 6XL. On the shirt, you can see 3 images that look really tight and they show a tent, trailer, and a campfire and below the 3 images you can see the text “Love Camping”. So now you can have the perfect shirt for your next camping trip and for planning your next trips or just for keeping the memories alive to the previous nice trips with tents and campfires. Now there is a going camping t-shirt that you can wear when you are ready for your next trip. 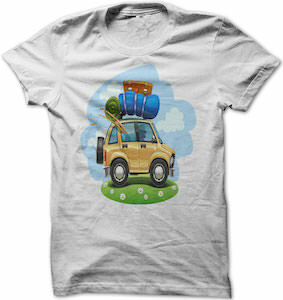 On the t-shirt you can see a car on green grass with flowers and it looks like the car is driving in a blue cloud with clouds inside it. On the car you can see many things and everything on it is what you need for when you go camping and as you can see the car is pretty full as the fishing rod is sticking outside the back window. It’s just a fun t-shirt for both men and women and it comes in sizes Small – 5XL and many colors are available too. 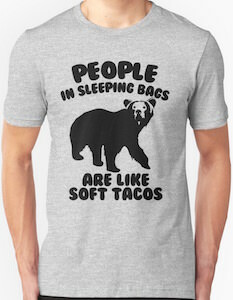 If camping and reading are two of your favorite things then why not combine them by wearing this t-shirt. On the t-shirt, you can see a campsite and instead of a tent you can see they put a book open on the right page and it seems like you are lying inside it reading. It’s just the perfect camping t-shirt for everyone that loves a good book and reading in nature. And this t-shirt is available in styles for both men and women and it comes in many fun colors and in sizes Small – 6XL. Get ready for that amazing book and a holiday and it all starts by wearing this t-shirt. 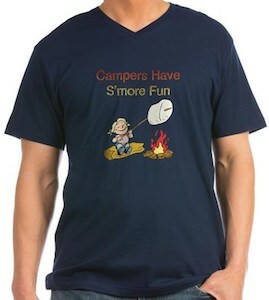 On the front of this shirt you will find a fun saying that all campers will enjoy, find the saying “I Have OCD Obsessive Camping Disorder” written in large white letters. You can get this awesome camping t-shirt in a wide variety of sizes that range from Small to 4XL so every camper can enjoy, it also comes in a choice of 7 fun vibrant colors and it will be super comfortable aswell as very durable as it is made from 100% cotton. You can also get this print on a a hoodie or a ladies fitted t-shirt. 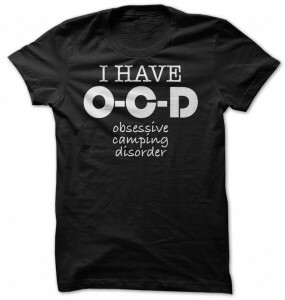 Go camping in the I Have OCD Obsessive Camping Disorder T-Shirt.